The Kamp-Rite Oversize Kwik Cot is large, just as its name suggests, as it is 84 inches long and 36 inches wide (~213 x 91 cm). When it is erected, it will have a height of 21 inches (~54 cm), which is more than enough elevation from the ground. This camping cot has the ability to hold a weight of 400 lbs (~190 kg) without bowing under the weight. And that is not all because this camping cot comes with its own carry bag that fits nicely and is zipped for easier and safer transport. 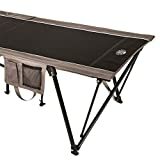 With hundreds of positive customer reviews on Amazon, there is every reason for you to buy this cot to make your camping nights rejuvenating with enough sleep. Most people look for the camping cot that they can set up fast when they get to their campsite and one that they can also fold up fast when they wake up in the morning or when they are breaking camp. The Kamp-Rite Oversize Kwik Cot has both qualities because you can set it up in a matter of seconds. With a strong frame of powder-coated steel, this cot is made to last through the outdoor elements. There is no warranty information as of now. There are many single camping cots in the market, but not many of them give as much room as this one. The Kamp-Rite Oversize Kwik Cot has been made with people who have large frames in mind. However, if your camping tent is small, this sleeping cot will not fit in and therefore you had better look for a smaller one. Have you tried this camping cot? Let us know what your experience is. What pros and cons can you list from your experience? It is always great to hear from people who walked the walk and can share their knowledge. Be sure to check out other great camping cots by visiting our camping cots reviews section.